SanDisk killed off its original Sansa View, a flash-endowed PMP shown at CES, and today announced that it is giving the name to a super-slim 16GB video and music player that will cost $199. It's no coincidence that this is twice the memory of Apple's new 8GB nano—at the same price. SanDisk's 8GB View will cost just $149, the price of Apple's 4GB nano. Like SanDisk's other players, the View will have an FM tuner (20 preset channels) and a voice recorder with built-in mic. The new View is SanDisk's first serious attempt at a video-capable player, with native support for H.264, WMV and MPEG4 video. (Earlier Sansas could play video, but only if you messed with it enough to make it work.) When you are in video mode, everything automatically reorients to landscape, so you can turn the View on its side and better enjoy the 2.4" 320 x 240 LCD. The View is the slimmest Sansa yet introduced. At its thickest is around a third of an inch—its total dimensions are 4.29" x 1.95" x 0.35", and it'll weigh just 2.9 oz. Interestingly enough, SanDisk isn't partnered with anyone on this go 'round. The Rhapsody friendship from the E200R days appears to have fizzled, and the Yahoo branding that appeared with the Sansa Connect is, as yet, just a one-off thing. Speaking of the Connect, the View will not have Wi-Fi. Then again, I can hear SanDisk saying, neither does the nano. Look for it this October. 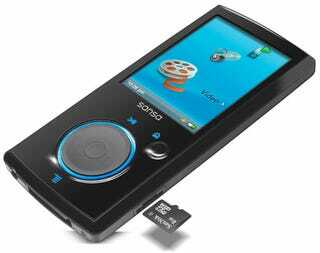 MILPITAS, Calif., September 10, 2007-SanDisk® Corporation (NASDAQ:SNDK), the second largest seller of MP3 players in the United States, today announced the new Sansa® View - a video MP3 player with a vast array of features and generous capacity, at an unbeatable price. The sleek-looking Sansa View marries the finest MP3 player attributes with full-motion video support (typically found in larger portable media players (PMPs)), a larger screen, long battery life and generous capacity—all in a thin, easy-to-carry package. Expected to be available in October, the Sansa View will carry a manufacturer's suggested retail price of $199.99 MSRP for a 16GB flash-based player and $149.99 for the 8GB, far surpassing the competition with respect to value and price. A significant step-up from the company's award-winning Sansa e200 music player series, the slim Sansa View features music, photos, FM radio and audio books, plus easy video transferring capabilities and hefty memory capabilities of up to 24GB (by using an optional 8GB microSD/microSDHC card). Consumers can purchase and insert one of SanDisk's microSD/microSDHC cards to play up to 24GB of music, video and photos on their Sansa View. (Today, SanDisk microSD/microSDHC cards come with capacities of up to 8GB.) In addition, the microSD card allows users to easily move their content to a cell phone or other mobile device.